So, Christmas. It's over. Has been for a little while now. 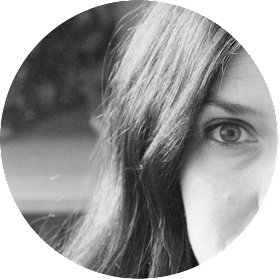 I hope that it has been long enough that I can bring it up again without reopening old wounds. (Christmas is painful. Don't tell me it's not.) I've never really been into Santa Claus. I think the tradition is silly. I don't usually tell people that though, especially around Christmas. Bagging on Santa at Christmas is a little like running into a sports bar and shouting "Football is Stupid!" Every idiot knows that is just a bad idea. But that is not what I wanted to say. Not even why I sat down. I even thought about deleting the above paragraph, but that "football is stupid" line just cracks me up. So lets get serious and begin our discussion of Christmas in the natural place: Halloween. 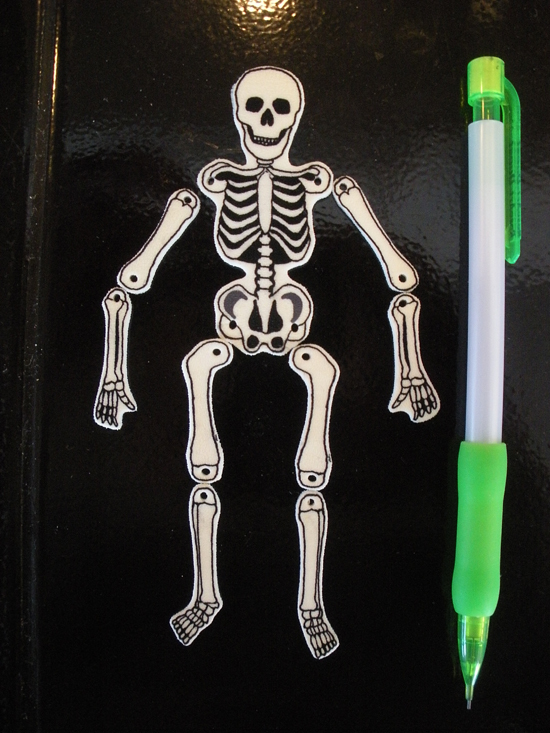 The first time I drew him a dinky skeleton on a piece of paper he was thrilled. He never let it out of his sight and had to show it to his dad when he got home from work. He also asked for it first thing the next morning, but by then I had thrown it away. So, being the kind and benevolent mother that I am, I went online and found him his favorite old Ben and Jerry's skeleton and printed it out on some white paper. 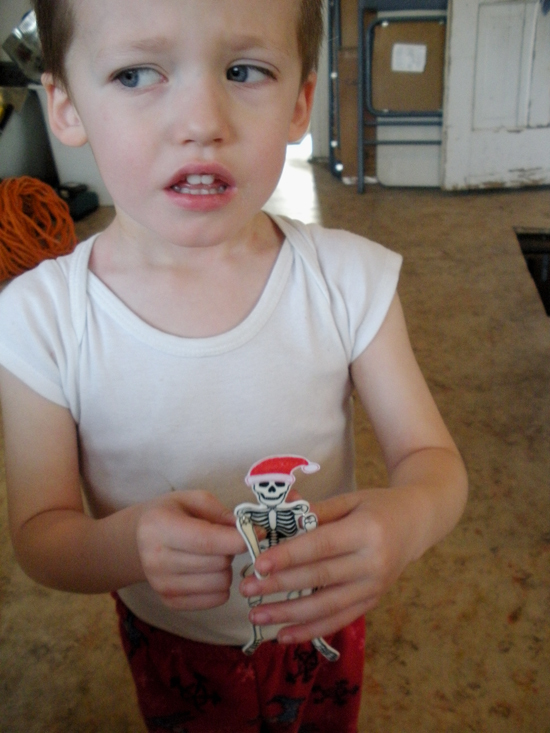 He stood next to me while I cut it out and taped it together and he was so excited he was crying. I kept saying "You gotta stop crying. I"m doing it." He would say "Yeah", but then his excitement would get he better of him and he would start to cry again. Paper toys are awesome. Very cheap, easy to store, pretty simple to repair. Mostly. For a little while. That skeleton was just not durable enough for the love it was showered with, and I got sick of taping it together. So, (wow, are you bored yet? I feel like I have been writing this forever! Feel free to leave now if you like. Is not like this story is really going anywhere.) 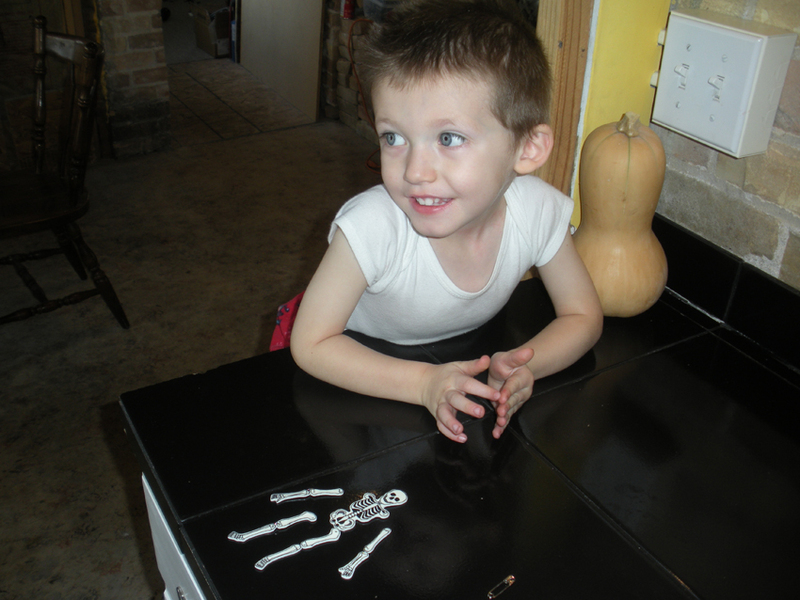 inspired by my mom, I made him a skeleton out of shrinky dinks. But was NOT pleased about having its picture taken. 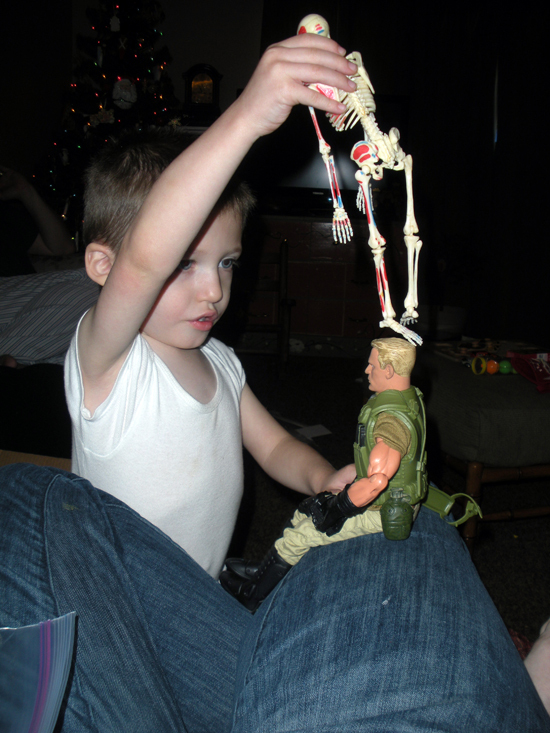 Anyway, I bought him a skeleton for Christmas. A cool little 9" tall anatomy model. And due to some shocking oversight on my part, it was the very first present he opened. He was so excited, all he wanted to do was open it and put it together and play with it. He could have cared less about the rest of the gifts. We had to coax and cajole to get him to open anything else. It's not like he had that much stuff, but when he didn't want to open any of them, it just felt like a lot of stuff we had to talk him into unwrapping. 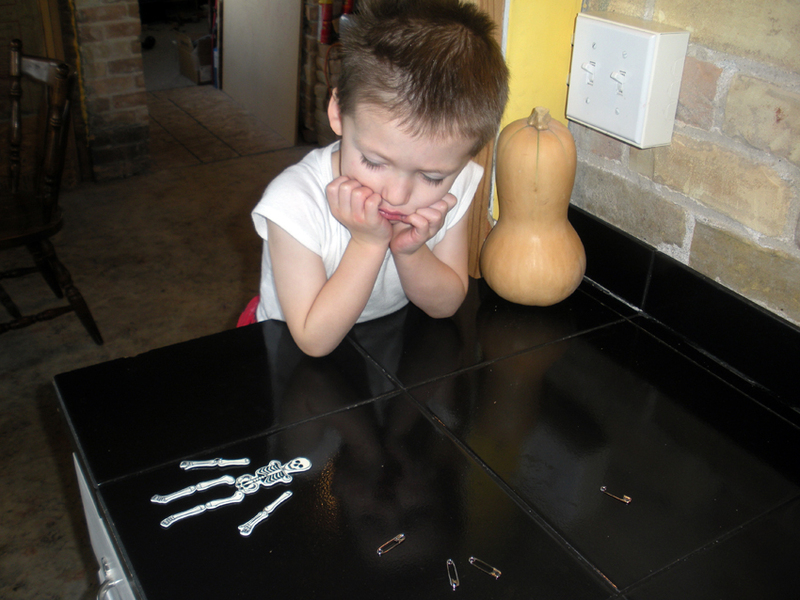 We did stop in the middle and put the darn skeleton together, to Harrison's utter glee, and then I had to bribe him to open the rest, like I do when I want him to finish his food. "Just two more presents Harrison! 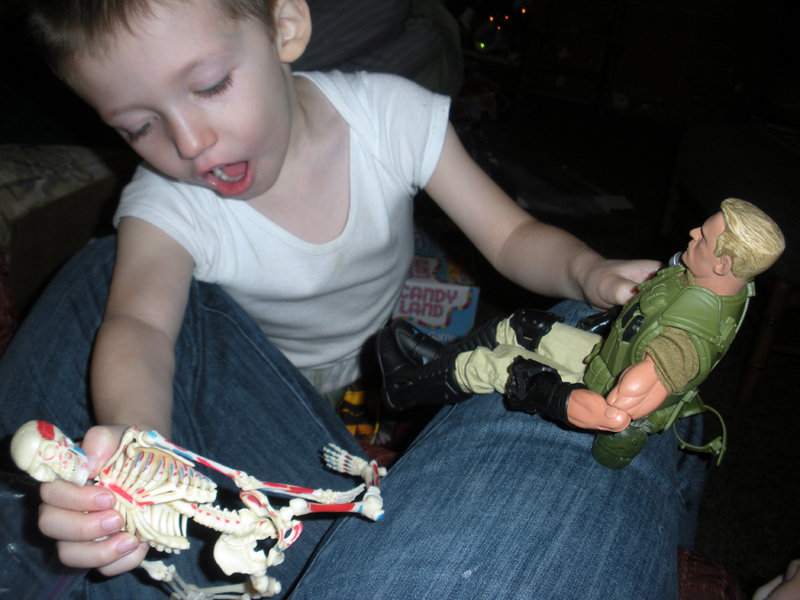 Just open two more presents and you can play with your skeleton!" 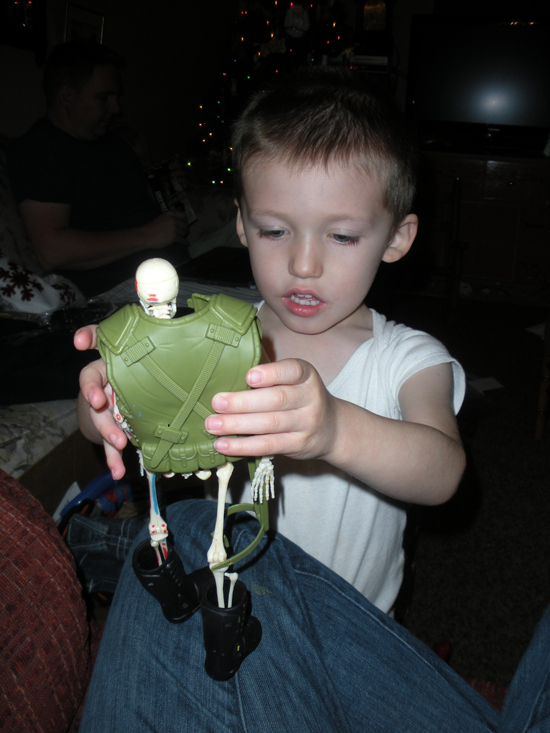 He calls it Skull and loves it more than me. This picture was taken right before Skull beat up G.I. Joe and took his vest and boots. It turns out the other half of the battle is actually knowing how to fight, which apparently G.I Joe doesn't. Poor Joe. And that is all! The end! Good for you!